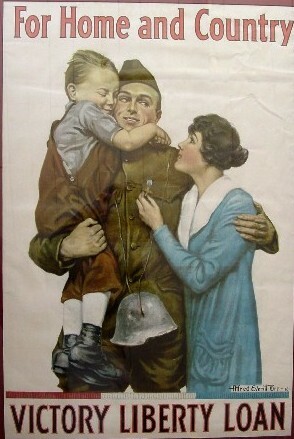 Comments: Striking family scene of GI in uniform on leave cradling his son and hugging his wife who is looking lovingly and holding a little cross while his war helmet dangles down. Well designed to promote sales of "Victory Liberty Loan" sales . Condition: Has some edge wear on one side with some repaired edge tears.